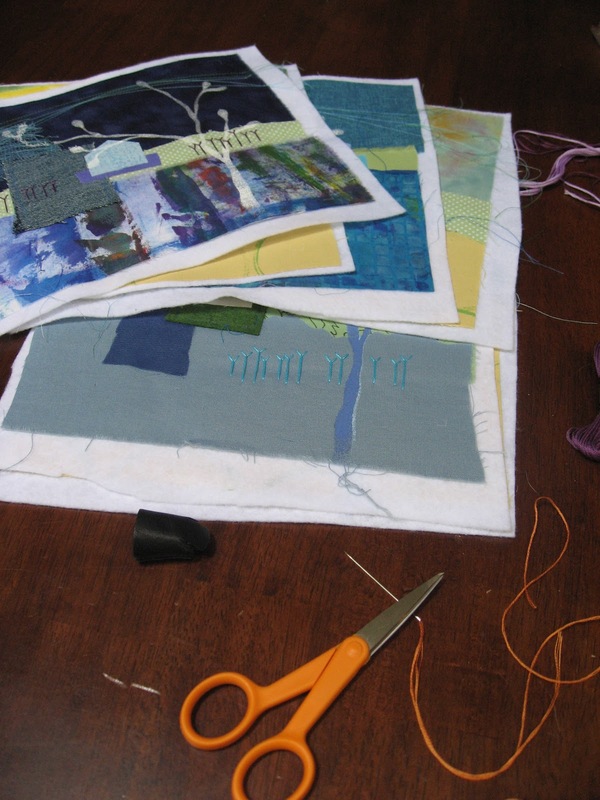 Have you seen the super fun collection of art quilts in our new ArtBox CSA? It's a new concept in sharing and collecting art -- borrowed from the very successful concept of farm CSAs where you get a box of whatever veggies and other products are in season. 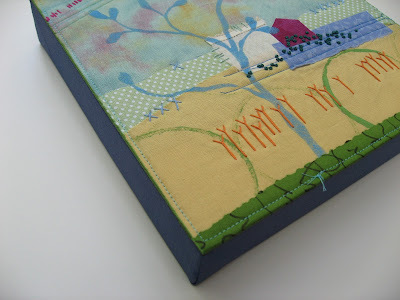 An ArtBox includes a piece of art from eight different fiber artists. I thought you might like to see the process of creating my share for the box. I created nine pieces for the ArtBox collection. I started with a few extras in case there were some ugly ones in the bunch -- it happens, right? I started by cutting felt for batting a bit larger than the 8x8 finished size. Actually, even before I cut the felt, I thought out my basic concept, style and technique. 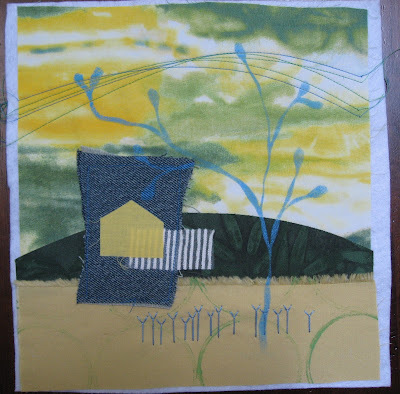 I decided on layered landscape collages similar to several other pieces I've created recently -- layers of cloth suggesting landscape elements, collage elements and shapes and stitches representing houses and flowers, leaves or trees. 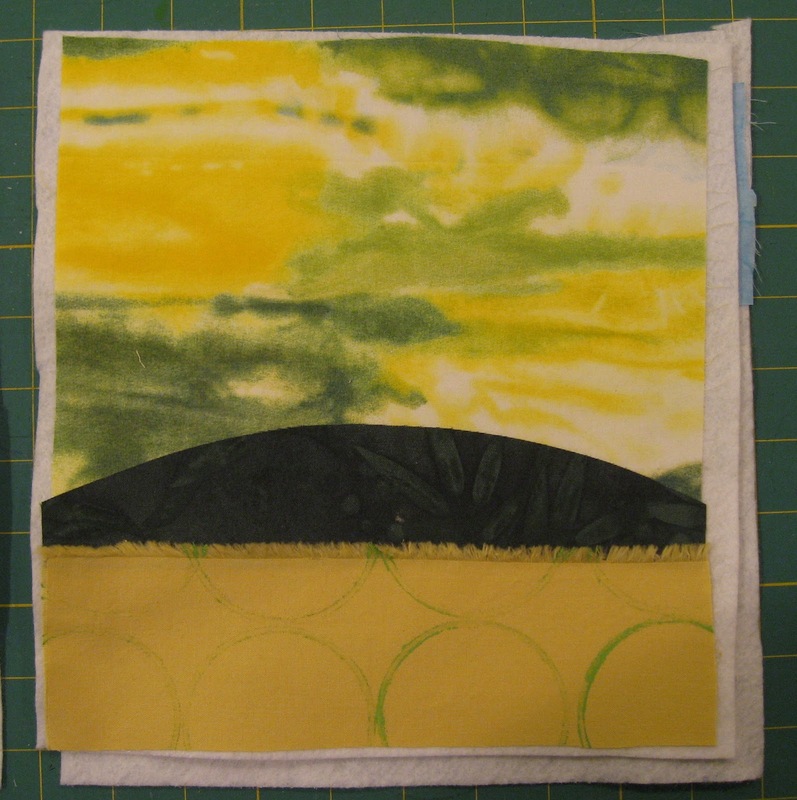 Then I chose three fabrics for each piece, a foreground, middle ground and sky. 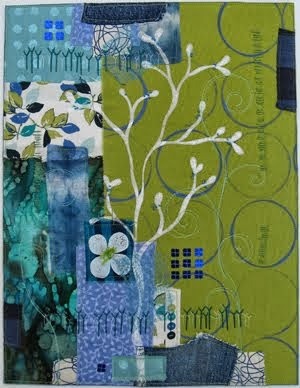 (Sky is very loosely implied in some of these pieces -- as in the green leafy batik fabric.) Each piece has at least one fabric with some original surface design and at least one commercial print. This step took a long time and lots of swapping, auditioning and digging through my fabric drawers. Next the foreground or middle ground sections were enhanced with some kind of interesting edge like a hillside, frayed edge or jagged cut. Plus everything got pressed and trimmed. Then the fabric was fused to the felt. So, I had 10 or 11 pieces looking something like this. Then I added a tiny focus-collage to each piece mixing in a house shape, some unexpected materials and sheer fabric. Then I laid them all out and made some notes about the additional elements and techniques that need to be added. I started by quilting graceful arches over every piece. I made several passes in a few different colors. I also machine stitched the collage elements to the background. Each piece got a painted branch/twig/tree shape. I used freezer paper stencils created especially to fit the composition of each design. Working assembly-line style can be really fun. It's so satisfying to finish each step. I like to work on 8 to 15 pieces ... more than that and I can get bored and overwhelmed. Then hand stitching of course! I had the big stack of quilts and my collection of floss on the table in front of the tv for several evenings. I originally thought the Ys might be enough on this piece, but it really needed more. So I added the trailing seed stitches. Nearly every piece got at least two different hand stitched motifs. Then I trimmed to the finished size and painted the edges to add just a tiny frame of color and seal the fabrics. I didn't take a photo of that step. Next the pieces had to be mounted to 8x8x1.5 inch canvases. I did take a few pictures of that process, but the I inadvertently deleted them while I was preparing my camera for our upcoming vacation. Oops. Here you can see the edge of one of my finished pieces. You can see my whole collection here. It's kind of fun to look at that image and compare it to the early shots where you can see the beginning stages of all the pieces. 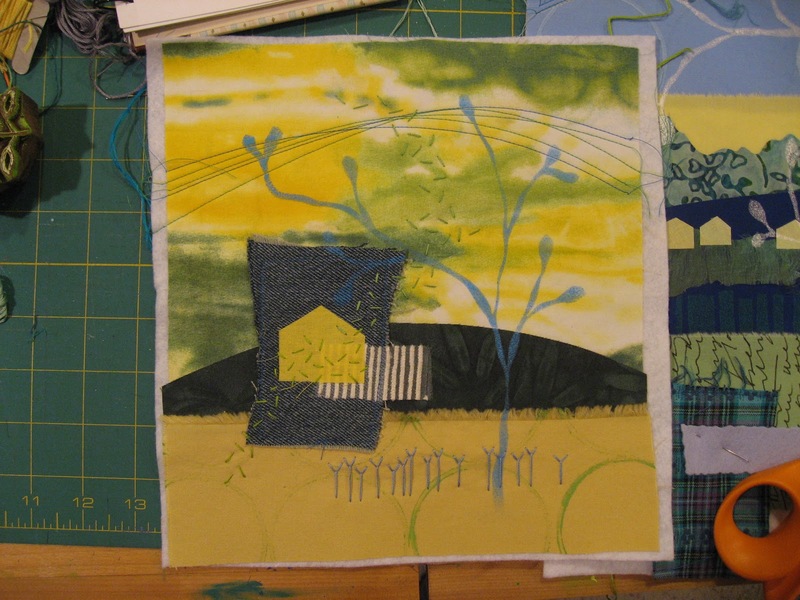 Hey, if you're interested in a bit more about this process, I hope you'll check out my dvd workshop Contemporary Fabric Collage. I discuss several of these kinds of techniques and walk through a very similar project on the dvd. One of the other ArtBox CSA artists blogged about creating her pieces for the ArtBox too. Check out Jamie's process here. Plus, you really should check out the rest of the art in the ArtBox. Maybe you'd like to start a collection. There are still some boxes available. Thanks for sharing your process - too bad about the mounting photos - that was something I was very interested in learning! I love the whole concept of the art boxes - amazing brainwave. The Art Box CSA is a really interesting project. 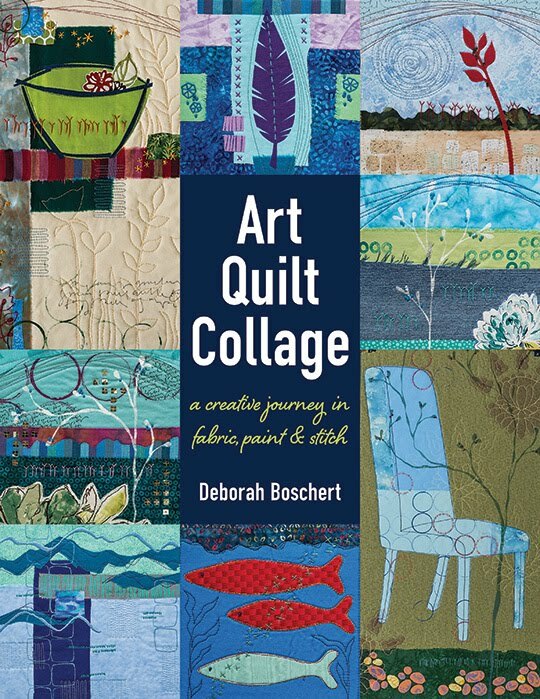 It seems like there's a few new and creative ways to buy/share art going on right now in the art quilt circle. Lisa Call's Buy ARt for Water looks to be an interesting take too. Thanks for sharing your process and your pieces -- they are a wonderful addition to the ArtBoxes. Congrats on being invited to be a part of the project. 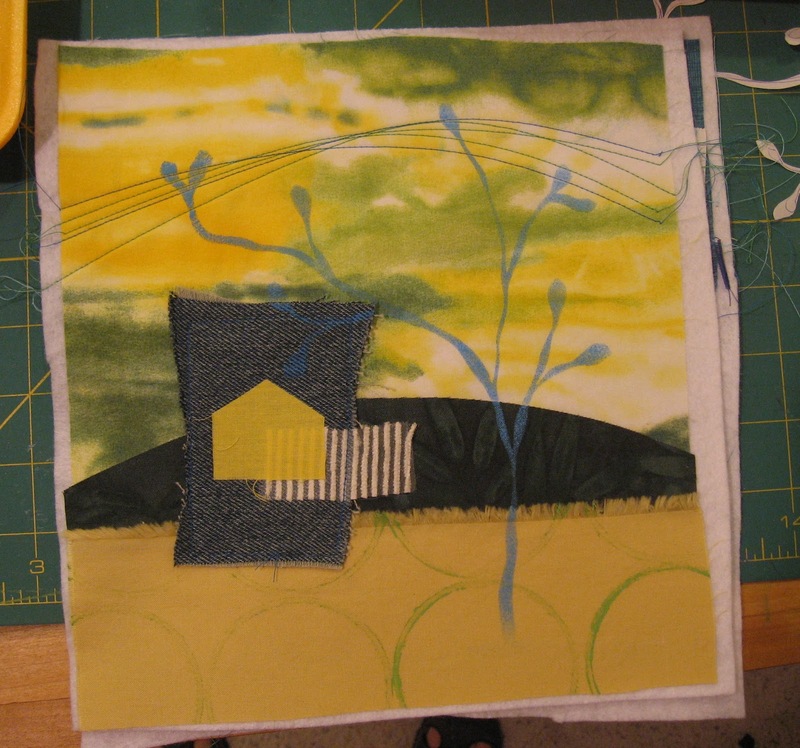 Nice to see more of your pieces using the technique you show in Stitched 2012. I am getting discouraged with my piece but seeing your work here has encouraged me to keep going! great work! Thanks for sharing your process and good luck with sales! Always am amazed at your creative process. I learn from you every time you show us your work. Thanks for sharing. Glad you had a great trip and are all back home safely. 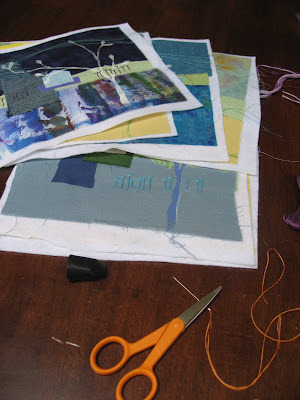 Debra, when you are working with felt like this, are you using crafter's felt or wool blend felt?